SAULT STE. MARIE, ONT. 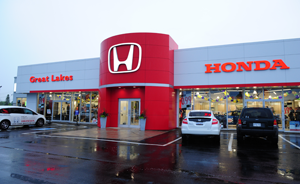 – Great Lakes Honda dealer Frances Floreani excuses herself. She is a trifle late for a telephone interview with Canadian AutoWorld. She explains that some British motorcyclists on a cross-country tour needed a gas tank replaced on one of their cycles. A gas tank for a motorcycle? Then it dawns that Honda is more than just cars; it’s lawnmowers, generators, motorcycles and ATVs. And so is Great Lakes Honda. 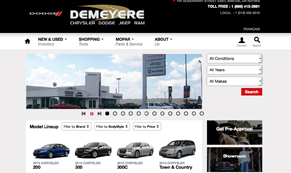 Floreani says the dealership was designed for the sale of more than just cars. Built on the site of an old Chevrolet store, the dealer says the old building was totally gutted and rebuilt to the latest Honda image requirements. The parts storage room of the old Chevrolet dealership is now a power showroom while the body shop of the old store is a repair shop for power equipment, motorcycles and ATVS. “We are becoming the place to repair power equipment,” she says. And she is confident that will soon mean the store will be the place to buy ATVs and motorcycles. She is also working on a test track complete with bumps and logs for ATVs and dirt bikes. On the car side of the 25,000-square-foot store in Sault Ste. Marie, Ont., there is room for five to six cars in the showroom, 10 service bays, two for detailing and one car wash.
Floreani says she was hands-on during the rebuilding process, which took nearly a year. She won’t discuss costs except to say she didn’t go over budget. But she is happy to discuss the special touches she insisted on. They include modular glassed-in offices with sliding glass doors. The sliding doors save space while the glass gives the showroom an open, transparent feel. On the second floor is another defining touch she is proud of: the boardroom is available free to non-profit community groups. “Support for the community is also a significant driver in how we approach business. Our tagline for the business is “Community Driven,” which more than just a name. It encapsulates how we feel about the community and our commitment to it,” she says. She went with LED lighting throughout because it offers low maintenance, long-term savings and shows off the cars at night. In the service drive, she insisted on Honda-red, steel technician cabinets with maple block tops because she believes they can withstand the rigours of a Sault Ste. Marie winter better than the OEM-mandated laminates. The extra cost was not a problem. “We are here for the long term,” she said. Another thing that makes Great Lakes Honda different is the dealer herself: Floreani has no dealership experience whatsoever. Her experience was in orthodontics, where she managed her husband Kent Floreani’s orthodontist’s office for over 20 years. Looking back on what was a big leap, she says “We knew that in the orthodontic field, it’s all about customer service and I knew I wanted to make the car business the same model. Before applying to Honda Canada, she went to NADA University where she took the dealership management course. Then she had to appear before a two-person panel at Honda Canada to convince them she knew what she was doing and had the money to do it. Gill, who was not there when Floreani argued her case, says he understood from colleagues that a strong point in her favour was her commitment to customer satisfaction. He cautions against the conclusion that the automaker is willing to take a chance on any bright-eyed newcomer, even one with deep pockets. She also agreed to surround herself with experienced staff, he said. Gill sees the store selling upwards of 500 to 600 new cars a year. “There will be growing pains in the first year. This is something that’s going to take some time. But we feel she will be to achieve those numbers in a relatively short time. In business since January, Floreani admits the first winter was a rough one for sales. But she says they are now meeting the sales target Honda sets.